Hello from Taipei. Fresh off a 12.5hr flight from AMS-TPE in China Airlines’ new A350-900 Business Class, I am pleased to report another great in-flight experience. The business class cabin is strikingly unique, with woodgrain accents and a dark color scheme. I love the lamps at each seat with ball and claw base. Service was warm and friendly. FAs addressed be my name and their smiles sure seemed genuine. Meals were nicely presented and tasty for the most-part. Wi-Fi onboard, serviced by T-Mobile, actually worked well. A flight pass costs $21. Business Class passengers do not receive complimentary vouchers. Bedding could be improved. There is no mattress pad and the blanket, while nice, is on the small side. I’ve now flown the A350 on Qatar, Finnair, and China Airlines. One of my favorite things about my first two A350s flights was the high-definition tail camera. Unless I simply could not find it, China Airlines does not have it. Ironically, its A330s, like I will fly from Taipei to Jakarta, do have cameras. 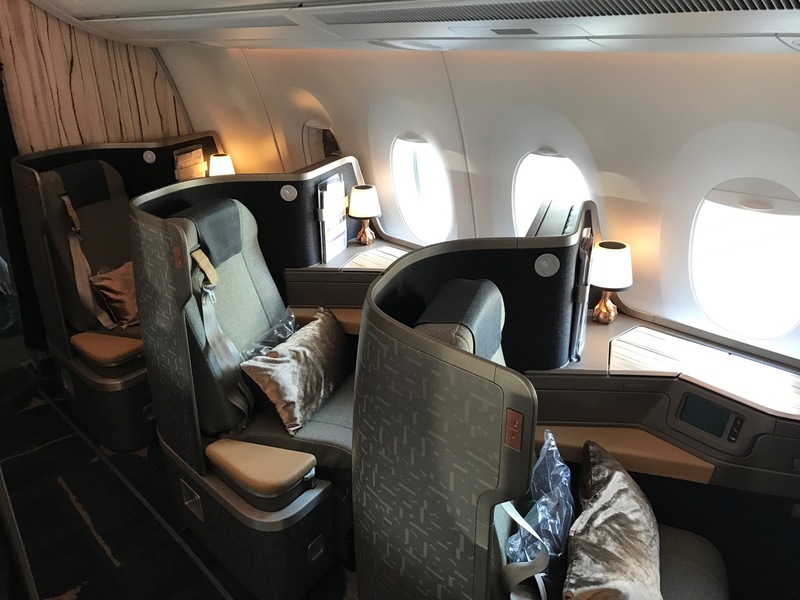 I’m seeing the best of SkyTeam this week — with a great flight on KLM, a great flight on China Airlines, and Garuda First Class up next I have newfound respect for what I consider the weakest of the three alliances. Good to hear. There’s airways so much open award space through all the alliances for Chinese airlines, but you read and hear such horror stories. This looks great. Seems like all the food you had was Western-style. Did you just not feel like eating Chinese/Asian or was it not offered? Hi Donald, there were two Asian/Chinese options on the menu for dinner and one for breakfast. I will almost always stick to western food — just a personal preference. The exception is on Korean Air (bibimbap). China Airlines is from the Republic of China (Taiwan) rather than Mainland. Worth noting that China Airlines isn’t really Chinese. Without getting into the politics: China Airlines is based in Taiwan, while Air China is based in (the People’s Republic of) China. Indeed, which is why I will only be comparing it to EVA Royal Laurel and not any Mainland carrier. Talking of SkyTeam. Where do you think is the best place to park the miles. Any preference and why? I will be flying Saudi Airlines in summer and was wondering where to credit the miles. Good question. I have been crediting my SkyTeam flights (obviously not this award travel) to Korean Air. My reasoning is simple: I have yet to fly First Class on Korean and I want to. But my recommendation for you really depends on where you want to go and what class of service. Let me know and I can make a more specific recommendation. I should have been more clear in the first place. I do not travel much (may be twice or once a year) mainly between US to SouthAsia or Southeast Asia or MiddleEast. Usually with the family (4, 3 or 2 people depending on who is free from school) and in business class. Recently I have a lot of pressure of visiting Europe which is only possible in winter as that is the best time when all the stars align (meaning there is no school guaranteed) Although X-Mas time is when most of the attractions in Europe might be closed. Flying Blue is great to Europe in business — often space for the whole family at 125K r/t plus about $550-600 in fees. Much better chance of finding space than using Delta miles, though if you did Delta it is 140Kr/t with no fuel surcharge. Korean Air now allows partner bookings online, but I think the program is too cumbersome to recommend unless you have a Korean Air ticketing office nearby. looks like CI improved their food presentation and using new chinaware. thanks for the review. i will be flying them from LAX to TPE to SYD to AKL, but on B773 and A333. hopefully, the food is as good as yours. Hmm but China Airlines is forced to call it that because the airline is facing threats of the Chinese government. Forced to call it what?